That. Is awesome. I want one. Neat! I think hes just about ready to Have intallation #3 of this build up, I know most of the mechanics are done, its now getting close to the digital side of things. If anyone in the Albuquerque area is interested in such things Quelab is Albuquerque’s Hackerspace. Could a camera and some software not do the job of 90 sensors? Thought: might it have been easier (though way less cool) to use a scanner or webcam to capture the rolls in transit, and figure out the rest in software? Similar to to all those automatic guitar hero projects? Others have already done this in a faster and easier design using a flatbed scanner. For full details on better ways of doing this. >so an optical sensor can be used to transform the analog data into digital information. There’s nothing analog about this data – it’s still digital data, even though it’s 50 years old and embedded on a paper roll. I thought this sounded like the hard way to do it. plus wont you get light leak? Not that the creator should feel discouraged. in fact the level of workmanship is really impressive. I still enjoy reading these kinds of posts. There are perhaps easier ways to do this, but I think it’s refreshing to see a different take on the problem. It’s two-dimensional data, digital in one direction (i.e. discrete positions for each key or pedal), but analog in the other (i.e. the length of one of those holes could be any value). Not to detract from the awesome looking machine, but some players let you “feather” the holes to adjust the playback, beyond having soft/sustain peddle tracks. This seems to only store hole/no hole instead of light intensity or whole width that a scanner based method would do. This reminds me of what happened when the Smithsonian discovered that they had in their collection a remarkable collection of piano rolls cut by such composers as Rachmaninoff, and Gershwin. They needed the piano that cut them to even play them back. It turns out of course that they had that as well. It was a simple matter to assemble a chamber orchestra of suitable instruments in their collection to play back the compositions. Of course that was an extreme case that allows for the availability of everything. I should also mention that the basic piano roll is about the size of a standard punched card. A computer over in Britain who used a similar method for running an Ammonia making plant, who was called ATLAS was re-purposed to run a sort of music making system not too long ago. While many are quick to point out that there are several other easier ways to simply make an archive of the music on these rolls. The potential I see with this method would be the ability to not only make an archive of the rolls but to also play them back in real time via the MIDI interface. Now if that is indeed the direction the author is going in well, IMO, major kudos to them because that’s pretty freaking cool. IBeHoey, Indeed That is part of it, We want it to be a working player, When it was found it was just the gutted paper transport, which in its self is awesome. it has a amazing self centering method that i really wish they had added to tractor feed and plotter printers! Looking at the old Lead tube vacuum lines weresmashed and cut, and it looked like a neat bit of history sestined for the junkyard. When this project is done, it will allow us to digitize the tracks, but that could have been done lots of ways as others have posted, this will allow us to live play them any number of ways, both in sound and in lights or other methods. All of which are more fun than just having a copy of a old time midi file on a computer. An Aeolian spool box no doubt, the finest. Tracking is disconnected, but should be hooked up with a servo to the two fingers at each side of the tracker bar. This keeps the roll centered on track. Players never encoded the soft pedal only the damper pedal. The exception of course were the reproducers like Aeolians DuoArt with 4 bits for each half of the keyboard that controlled volume. This was binary weighted 1-2-4-8 in 1913! Midi only uses twice the bits but for each note. These players were fully automatic, incl reroll and shutoff. Whats missing from a roll conversion to midi, is the absolute joy of playing with your feet the volume of your own expression. This should be done in midi with a control in real time or edited into the work. A player running on a suction source is as boring as hearing recordings that have been compressed or peed on by mp3. Thanks for the links. I will follow them up, as I rebuild players and want to hack a roll perforator to preserve old rolls and bring new music to this old digital realm. Acid paper is taking it’s toll. At it’s peak the player was in 85% of pianos sold and the home entertainment system of choice. Couldn’t agree more and I’m very happy to hear that you are going in that direction. Very, very cool. I’ve always been fascinated by the old player pianos and really hope to own one someday. I just might have to end up following in your footsteps and building one for myself. You sir have inspired me, and for that I thank you. Reminds me of waking up to “O What a Beautiful Morning” when I was a kid, when my parents had a player at the bottom of the stairs. Music-pirating just got a little more steampunk! A similar process was used to recover a set of “reproducing piano” rolls cut by Rachmaninov himself. They digitized the rolls (which WERE analog, capable of reproducing the nuance of volume and tempo) and played them back on a more modern piano with midi control. The result was recorded and released as “A Window In Time”, and it’s fantastic. In all likelihood that was the second time this had happened. See my first comment. But the first time they had done what is going on here. I remember listening to the album on WQXR-FM, the new NPR station in NYC last year. hackaday, is there a typo here? 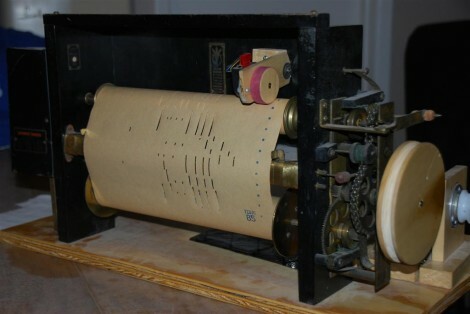 Many years ago I made a piano-roll (and band-organ book) reader from parts of an old FAX machine. The FAX machine had a line-scan CCD camera, analog compensation and quantization for the video, and several channels of 1-bit memory. Metal templates were made for each of the different kinds tracker bars to be supported. Care was taken to make the templates with exactly the same hole spacing as a tracker bar, but with holes about half the diameter of the tracker bar hole width. When the template was inserted between the light source (a florescent tube powered with DC) and the line-scan camera, the resulting digitized `video’ was recorded in on of the memories, that I called the template memory. This was `training mode’. Later, in `use mode’ the roll or book was fed through the machine, the system was effectively sensitive only to the light that passed through the centers of the holes in the book. Each camera scan of the roll or book traversed from one side, and as it went the memory address incremented at the camera pixel rate to 4096 across the width of the book. Each of the template `images’ consisted of several consecutive bits in the memory. In `use mode’, the camera video was recorded in one of the other memories. The digitized camera video was also compared with the recorded video from the previous scan (stored in the the other data memory. The comparison was done using a 2-line to one of four decoder to easily detect Note-ON and Note-OFF. The comparison was gated with the output of the template memory, causing the sampling to be done near the center of each hole (width-wise). At the end of each camera scan, the two data memories were swapped. Also at the beginning of each camera scan, a counter was initialized, and then counted each template memory bit as the camera scan progressed. When the counter was initialized with the proper value, the counter gave the MIDI note number for each row of the roll or book directly. Thus each Note-ON and Note-OFF would have the proper note number. The piano rolls I recorded were for Ampico, one of the varieties of `reproducing piano’. Several rows near each end of the tracker bar are used to control the `expression mechanism’ of the piano. To simply play the rolls (i.e., without expression), the signals from the `expression rows’ rows (i.e., certain of the MIDI notes) should not be forwarded to a MIDI synthesizer. A more elaborate system would use the expression signals and some simple analog circuitry to model the behavior of the pneumatic servos in an Ampico (eight levels of expression plus, fast and slow crescendo, decrescendo and faster discharge). The result, digitized, would be used to set the MIDI `pressure’ value for each MIDI Note-ON. Incidentally, an Ampico has only two expression `channels’, one for `bass’, the other for ‘treble’, divided a few notes above middle `CV’. MIDI has individual `pressure’ control for each note. Does anyone think this system could be adapted to play the paper roll’s used on Wurlitzer Band organs? I have several rolls that were used on a style 153 Wurlitzer Band Organ used on an amusement park carousel. The Organ was sold at auction, but I still own the original roll’s and one of the roll reels that was used as a spare for quick change of the music roll’s. Chuck L. Connecticut.